McMichael, D.F. 1956. 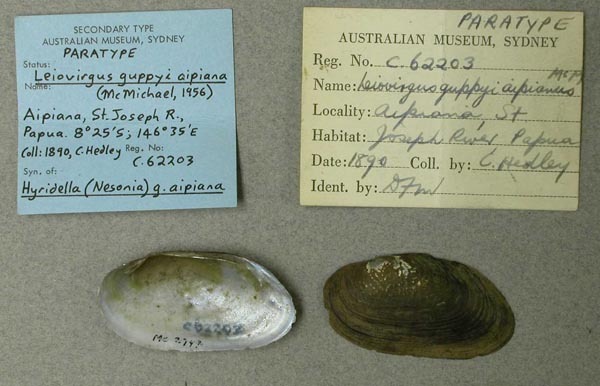 Notes on the freshwater mussels of New Guinea. Nautilus 70(2): 38-48. Haasodonta fannyae (Johnson,1948). — McMichael (1956: 47). Leiovirgus guppyi (Smith, 1885). — McMichael (1956: 44). Leiovirgus guppyi aipianus ssp. nov. — McMichael (1956: 44). Leiovirgus lorentzi (Schepman, 1919). — McMichael (1956: 44). Leiovirgus misoolensis (Schepman, 1897). — McMichael (1956: 42). Microdontia anodontaeformis (Tapparone Canefri, 1883). — McMichael (1956: 41). Velesunio ovata (Haas, 1910). — McMichael (1956: 40). Velesunio sentaniensis (Haas, 1924). — McMichael (1956: 39). Velesunio wilsonii (Lea, 1859). — McMichael (1956: 40). Virgus beccarianus (Tapparone Canefri, 1883). — McMichael (1956: 46). Westralunio flyensis (Tapparone Canefri, 1883). — McMichael (1956: 41).